Yankee Books. Hardcover. POOR. Noticeably used book. Heavy wear to cover. Pages contain marginal notes, underlining, and or highlighting. Possible ex library copy, with all the markings/stickers of that library. Accessories such as CD, codes, toys, and dust jackets may not be included. Yankee Books. Hardcover. 0899091024 Ships promptly from Texas. . Fair. 1986. Rodale Press, Incorporated, 1987. Hardcover. Good. Disclaimer:A copy that has been read, but remains in clean condition. All pages are intact, and the cover is intact. The spine may show signs of wear. Pages can include limited notes and highlighting, and the copy can include previous owner inscriptions. The dust jacket is missing. At ThriftBooks, our motto is: Read More, Spend Less. Yankee Books. Used - Good. Shows some signs of wear, and may have some markings on the inside. Yankee Books. Used - Good. Ships from Reno, NV. Former Library book. Shows some signs of wear, and may have some markings on the inside. 100% Money Back Guarantee. Shipped to over one million happy customers. Your purchase benefits world literacy! Emmaus, Pennsylvania, U.S.A.: Yankee Books, 1986 Dust jacket chipped at top of spine, a couple 1/2" tears. Pages of text are clean, lightly toned and free of markings. Binding is tight and secure. ***We ship daily. Our books are carefully described and packaged in boxes (not envelopes). A gift card and personalized message can be included upon request.*** . Hard Cover. Very Good/Good. 8.25 x 5.5. Emmaus, Pennsylvania, U.S.A.: Yankee Books, 1986. d/j has some edge wear with very small tear on the bottom edge o/w clean copy. Hard Cover. Very Good/Very Good. 8vo - over 7¾" - 9¾" tall. Yankee Books, August 1986. Hardcover . Used Good. We carry new and used books in our storefront. We want you to be satisfied with your purchase. Please contact us if you have questions regarding this item. Yankee Books, 1986-08. Hardcover. Good. Yankee Books, 1987. Unabridged. Hard cover. Fine in very good dust jacket. The dustjacket is in Near Fine condition. 208 p.
Dublin, NH: Yankee Books. VG+/VG+. Hardcover. Very good plus book, stated first edition, second Yankee books printing; it is clean, straight & tight; lightly bumped spine ends and two small dings on upper edges, also previous owner's gift inscription on front endpage. Price intact dust jacket is clean, bright & crisp; it has some edge wear/chipping and a couple of small edge tears. From dj.....These are sharp and vivid stories of the author's encounters with ghosts, meetings that support his view that ghosts are unhappy people, ready to be sent beyond the veil. ; 8 x 5.5 inches; 202 pages . Rodale Press, Incorporated, 1987. First Edition. Hardcover. Very Good. Disclaimer:A copy that has been read, but remains in excellent condition. Pages are intact and are not marred by notes or highlighting, but may contain a neat previous owner name. The spine remains undamaged. At ThriftBooks, our motto is: Read More, Spend Less.First edition, first printing. Minor shelf and handling wear, overall a clean solid copy with minimal signs of use. Secure packaging for safe delivery.Dust jacket quality is not guaranteed. Yankee Books, 1986. 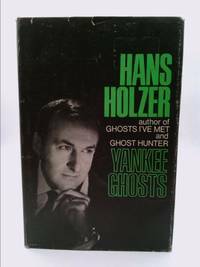 (1st Yankee) Slightly smaller book, brown cloth spine, red-brown cloth boards, bright gilt lettering on spine, 202 pages plus a final word and list of Holzer's books. DJ has colorful lettering with oval illustration of haunted house and passing hiker on front, praise for other Holzer books on back from Chicago Tribune, Saturday Review and others. DJ has light wear to top tips, microtears and light crease at top front edge, microtear at spine edge, and top back edge. Very Good DJ/Very Fine book.. First Thus. Cloth. Fine/Very Good. Yankee Books. Hardcover. 0899091024 Like New Condition. . Fine. 1986-06-01. Good. Ships with Tracking Number! INTERNATIONAL WORLDWIDE Shipping available. May not contain Access Codes or Supplements. May be ex-library. Shipping & Handling by region. Buy with confidence, excellent customer service! Yankee Books, 1986-08-01. 1st. Hardcover. Used:Good. Yankee Books. Hardcover. 0899091024 New Condition. . New.